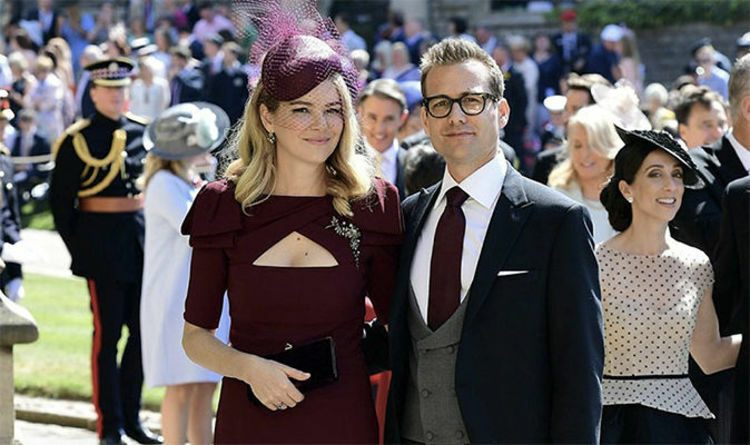 Gabriel, who plays Harvey Specter in the US legal drama, arrived in the UK earlier this week with his wife Australian actress Jacinda Barrett. Sarah Rafferty, who plays Harvey’s fiesty secretary Donna, was also spotted arriving at the Chapel. Ms Rafferty wore a black dress with dramatic sleeves. Meghan’s on-screen husband in the TV show Patrick J Adams arrived with wife former Pretty Little Liars actress Troian Bellisario. Mike Ross wed Meghan’s alter-ego Rachel in the drama Suits. The actor, who joked that he thought his co-star was popping out to “get some milk” when her engagement was first announced, was at Windsor to watch his screen-wife marry for real. He arrived with his wife, actress Troian Bellisario, for the ceremony. Other Suits stars Gina Torres, who plays Jessica Pearson, and Abigail Spencer, who plays ‘Scotty’ on the TV show were also at the Royal Wedding ceremony. The night before the Royal Wedding the Suits cast was pictured enjoying dinner together at the Barn Restaurant in Coworth Park. An array of celebrities, sports stars and actors including British actor Idris Elba, David and Victoria Beckham, rugby star Johnny Wilkinson, Amal and George Clooney, US host star Oprah Winfrey, UK singer James Blunt, polo star Nacho Figueras and his wife Delfina Blaquier, musician Marcus Mumford, actress Carey Mulligan and comedian James Corden were also invited to the ceremony.